I FOUND THESE AMAZING WASABI PEAS (MUST HAVE THE PASTE ON THEM) AS A HEALTHY SNACK IN MY WALMART STORE! THEY ARE SUPER SPICY AND CLEAR THE SINUSES IN THIS COLD, COLD WEATHER! CRUNCHY AND SATISFYING WITH ONLY 2 GMS OF FAT IN 1/3 CUP OR 100 CALORIES!! 4 GMS OF PROTEIN TOO! I RATE THEM A 5 OF 5 STARS FOR A COOL, HEALTHY SNACK! *Soppressata is an Italian dry salami. Two principal types are made: a cured dry sausage typical of Basilicata, Apulia and Calabria, and a very different uncured salami, native to Tuscany and Liguria. ^I added crumbled Feta cheese and used my favorite Greek salad dressing! Preheat the oven to 450 degrees F. Set a pizza stone on the bottom of the oven (alternatively, the pizza can be baked directly on the oven rack). 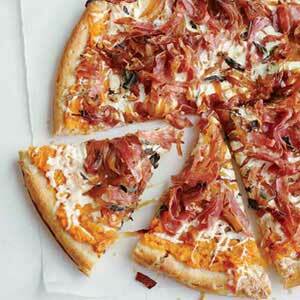 Spread the sweet potatoes over the pizza crust. Top with the cheeses, onion, seasonings and soppressata. Drizzle balsamic vinaigrette over top. Slide the pizza onto the stone and bake for about 15-20 minutes, until bubbling and golden in spots. Cut into wedges and serve. GET AWAY FROM THE RED MEAT TACO AND TRY THIS SPICY DELIGHT! COOKING MAINLY IN THE CROCK POT ALLOWS YOU TO GET YOUR OTHER WORK DONE WHILE DINNER IS ON! Place first seven ingredients in Crock Pot and cook on LOW for 5 hours. Take out chicken and dice. Add brown rice and cumin; return diced chicken to the crock pot and cook another hour. Place a generous scoop of chicken and rice mixture into the center of a flour tortilla. Top with shredded cheese and salsa. Wrap up and serve. MY HUSBAND LIKES HIS IN A WRAP BUT MINE ALWAYS FALL APART SO I SERVE MINE “OPEN” WITH SOME WHITE CORN TORTILLA CHIPS. ROUND OUT THE MEAL WITH A FRESH VEGETABLE SALAD! CREATE YOUR OWN BEER BATTER FISH FRY AT HOME. I MADE MINE WITH HADDOCK FILETS WITH A SIDE OF OVEN ROASTED POTATOES AND SQUASH AND BROCCOLI SLAW! In a small mixing bowl, combine baking mix with beer, adding a little beer at a time and mixing well until a somewhat thick pancake batter consistency. Add salt and pepper and mix well. Heat the oil in a large skillet over medium-high heat. 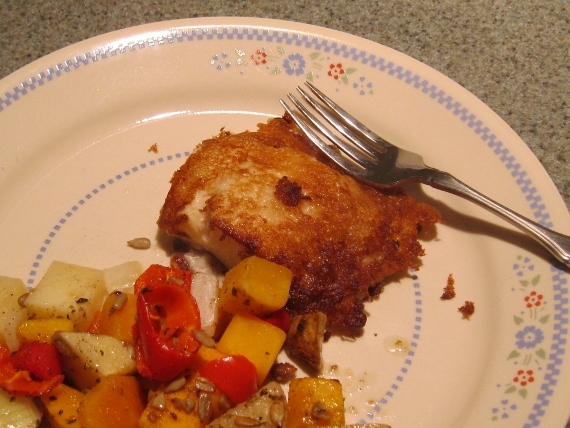 Dip haddock into batter coating well and add to skillet. Cook about 5-7 minutes, turn and repeat until golden brown on both sides. PREHEAT OVEN AT 400 DEGREES F. CUT UP ALL THE VEGETABLES AND SPREAD OUT ON A FOIL LINED COOKIE SHEET. SPRINKLE SEEDS AND SALAD DRESSING OVER TOP. PLACE IN HOT OVEN AND BAKE WHILE PREPARING THE FRIED FISH. *REMEMBER TO USE SWEET POTATOES WHENEVER POSSIBLE IN PLACE OF WHITE POTATOES FOR IMPROVED NUTRITION. MY HUSBAND WOULD HAVE LIKED A LITTLE MORE BATTER ON THE FISH SO I WILL TRY A THICKER BATTER OR DOUBLE DIPPING ANOTHER TIME AFTER FRYING ONCE! THIS IS A GREAT RESTAURANT MEAL MADE AT HOME KEEPING FAT LOW BY USING MINIMAL OIL RATHER THAN DEEP FAT FRYING. KEEP SALAD DRESSINGS TO A MINIMUM AND ADD MORE IF NEEDED . A HEARTY MEAL MADE EASY USING THE CROCK POT! Prepare rice according to directions. Add green beans and sour cream. Set aside until last hour of slow cooking. Place onion in slow cooker. Coat roast with seasonings. Place in slow cooker. Add broth. Cook on LOW 6 hours. In the last hour of cooking, take out roast and most of the juice. Put rice mixture in the bottom of the crock pot. Slice roast into chops and place over rice. Add juice and complete cooking. Serve with a fresh salad – ENJOY! MAKE THIS DISH IN THE SLOW COOKER AND ADD THE RAVIOLI AT THE END FOR A SUPER EASY DINNER! Place sausage, mushrooms, onions, tomatoes and artichoke in slow cooker. Cook on LOW 5-6 hours. Cut up sausage. Cook ravioli, drain and add to slow cooker. Serve in bowls topped with Gorgonzola and Parmesan cheeses. FOR THICKER SAUCE ADD 1/4 C TOMATO PASTE NEAR THE END OF COOKING WHILE BUBBLING. 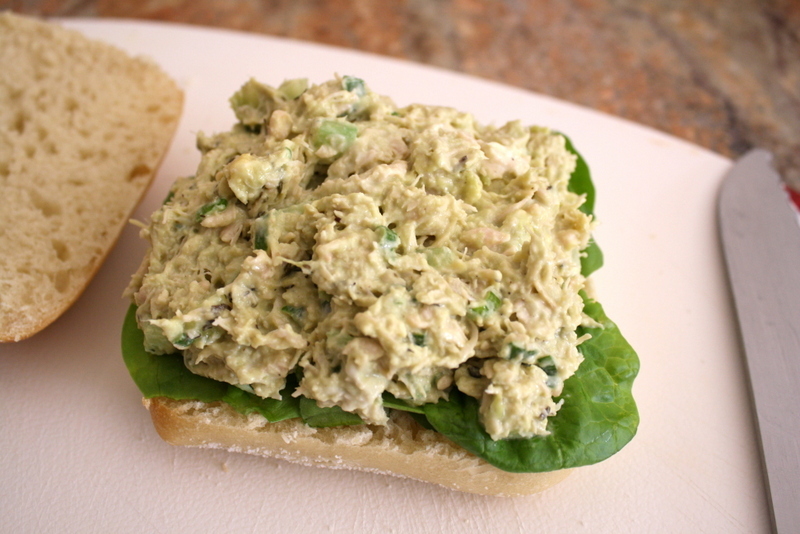 SERVE WITH A BIG SALAD AND SOME WHOLE GRAIN ROLLS. IF I HAD AVOCADO I WOULD HAVE ADDED THAT AND PERHAPS SOME OLIVES. THE POSSIBILITIES ARE ENDLESS! 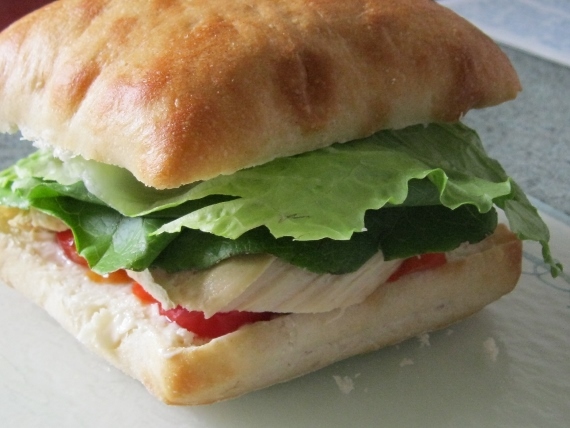 I SERVED MY WARMED ON CIABATTA ROLL WITH A SLICE OF PEPPER JACK CHEESE AND ADDED A LETTUCE LEAF! Place squash on a nonstick jelly-roll pan coated with cooking spray. Bake at 475° for 20 minutes or until tender, turning after 10 minutes. Combine water and wine in a saucepan; bring to a simmer. Keep warm over low heat. Add onion and oil to fry pan; sauté 10 minutes or until onion is tender. Add garlic; sauté 1 minute. Add rice to pan; sauté 1 minute. Stir in wine mixture and spice packet; bring to a boil over medium heat. Reduce heat, and simmer over low heat, uncovered, for 10 minutes. (Do not stir; rice will have a liquid consistency similar to stew.) 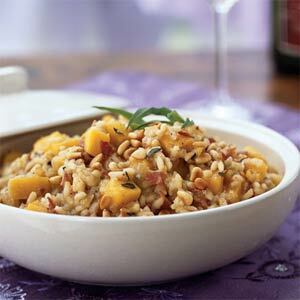 Stir in the squash, bacon pieces, cheese, salt, and pepper. Cover let stand 10 minutes (rice will continue to cook). Sprinkle with pine nuts. Garnish with tarragon sprigs, if desired.